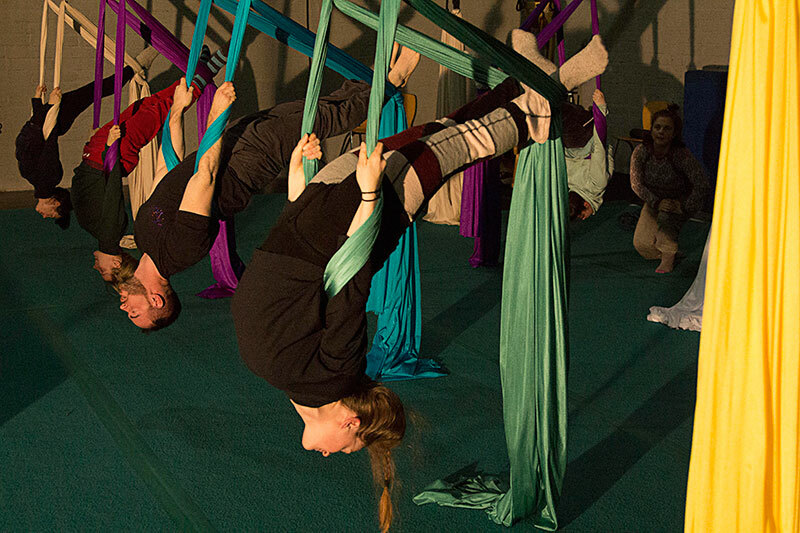 The Creative Intensive is an annual three week training on aerial technique and creativity. This training program for professionals was designed for aerialists who want to work on improving their technique and produce aerial acts, and also for dancers who want to get more aerial training and create an aerial dance solo. The course is hosted by tutors from Fidget Feet Aerial Dance and Rachel Strickland from MadameRex.com. There will be a public showing in the IACC of the work created, on the last day of the intensive. Once you have read all the information below, you can apply for the Creative Intensive here. The application deadline is: Monday 12th August 2019 and applications are open. The course is designed for intermediate through to professional level students. 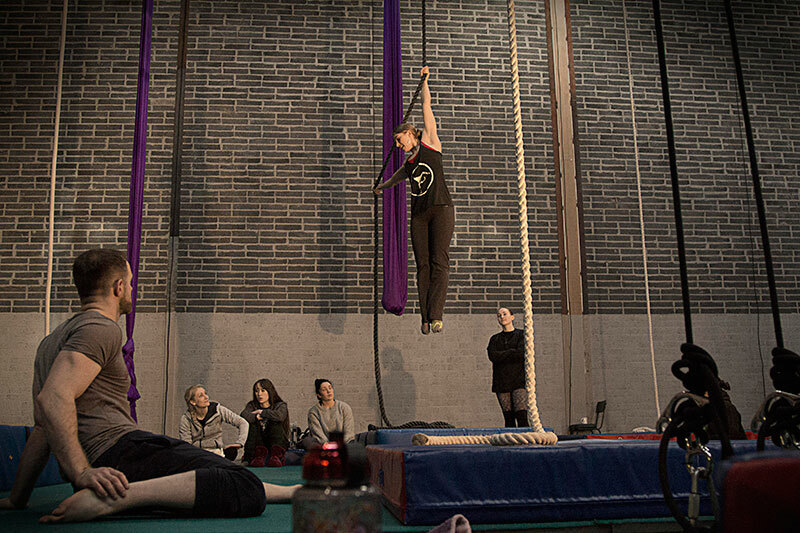 We offer contemporary dance classes, stretching, strengthening and conditioning, aerial technique classes in rope, fabric, hoop, and trapeze. We also offer creative labs, one to one mentoring from the 3 tutors, and rigging basics. We also allow for Sunday open training; during this open training it is possible to book the coach for one to one at an extra cost. We will have lunch-time talks on act selling, budgets, insurance etc. The work will be geared towards the showing in December. We will be offering training towards show-making, working with professional riggers, lighting and sound technicians, costumes and make-up. The course ends with a public performance of the acts in the IACC on the last day. Each performance is filmed with a professional set-up of three cameras and audio. You’ll receive the footage after the intensive, so that you can use it for show reels etc. All are welcome, so invite family and friends. The IACC will invite funders and theatre managers. This course is funded by Arts Council to support higher-level training in Ireland. 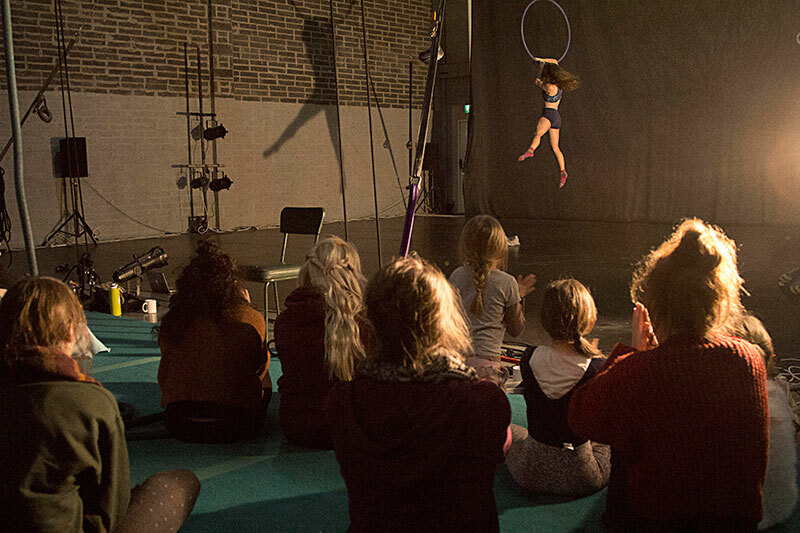 One scholarship and eight half fee bursaries (€500) for Irish born or Irish based aerial circus performers and 7 full price spaces @ €1000 each. That’s a total of 16 places. Once you are offered a place, you must pay a deposit of 50%. If you cancel within one month of the start date, you must pay the full fee regardless. This is due to multiple late cancellations in the past. The international panel will make the decision within one month, and all applicants will be notified whether they were successful. Click here to pay the deposit. Parental/guardian consent if you are 16-18yrs. Chantal Mc Cormick trained as a dancer and choreographer at the London School of Contemporary Dance. 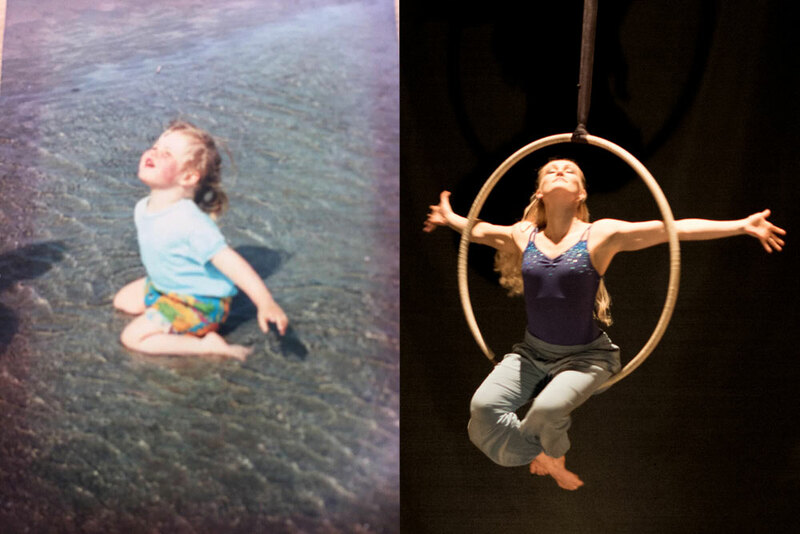 After graduation she became interested in aerial circus and trained at Circus Space, London. Chantal has toured extensively with established dance and circus companies in the UK from 1999-­‐2008. The company Fidget Feet was founded in 2004 by Chantal (Donegal) and her husband Jym Daly (Cork). Chantal has directed, choreographed, and performed shows with FF including; Wired and Free, Fairies Tail, Remember Her, Madam Silk, Raw, Hang On, Catch Me, Fire Birds and Elves and the Shoemaker she was recently invited along with FF to choreograph all the aerial work and perform and collaborate with CoisCeim in the acclaimed RTE, Centenary. Chantal is also the Artistic Director of Irish Aerial Dance Fest and professional development manager at the Irish Aerial Creation Centre. 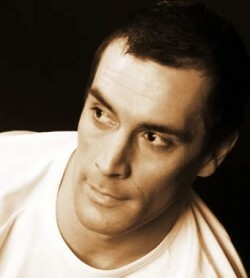 Lee Claydon started dancing at the age of 21 and graduated from London Contemporary Dance School with a 1st degree. Lee’s first encounter with Fidget Feet was on the production RAW, in 2008. He is now associated artists with Fidget feet and is one of the company’s main performers, teachers and riggers. He has worked on The Snow Queen, Catch me, Hang on, Firebirds, A Fairies’ Tail, The Elves and the Shoemaker and most recently performed as the Raven in RTE, Centenary. In 2013/14 Lee worked on the company’s upcoming production, The Second Coming. Rachel Strickland Classically trained in ballet since the age of three, Rachel is a dancer turned aerialist, choreographer, and variety performer. She began her study of circus arts in 2007, developing a unique style and approach to aerial work, and has performed extensively across the United States and around the world. As a performer and choreographer, Rachel is known for her innovative combinations, movement quality, and her rather obsessive study of spiral momentum. 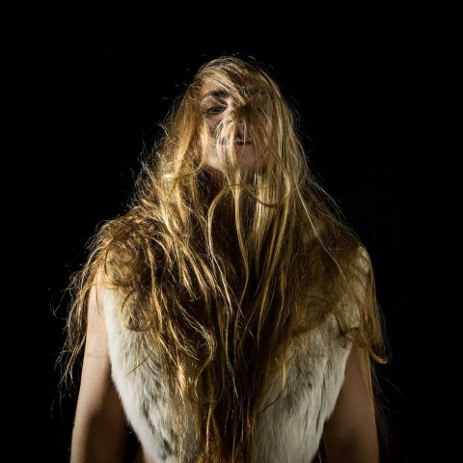 International collaborations include devising choreography and performing with Fidget Feet Aerial Dance in Ireland, as well as the award winning show “Elements” with Natural Wings out of Perth in Western Australia. Homemade recipes include writing and producing “Icarus” which debuted in the 2013 New Orleans Fringe Festival. She feels honored to have worked on US soil with such fine companies as ticktock, Emerald City Trapeze Arts, Madame Rex Entertainment, Kinetic Arts Productions, Trapeze World, Queensryche, and Circus Automatic. For more interviews and videos about the Creative Intensive see here. Trying to describe the Irish Aerial Creation Centre’s Creative Intensive, is like trying to describe the ocean to someone who has never seen it. It is achingly inspiring, stunningly beautiful and for seeing it you are forever changed, but finding adjectives to do it justice is a daunting, if not impossible task. Nevertheless, I will try. The Creative Intensive is a holistic immersive exacting adventure that allows you to truly access your creative potential and to explore it in ways you never imagined possible. Once you begin you will be overwhelmed by the nurturing atmosphere promoted by the exceptional mentors and fellow participants. You are encouraged to challenge yourself technically, learn earnestly and create assiduously. The expertise you have access to is incomparable but most of all it is the caring indefatigable humans you get to know that make it truly special. While at times it may be demanding, both physically and emotionally, it is the sort of exertion that breeds something profoundly precious. But most of all, it is the gift of time. Time for you to undeniably indulge and luxuriate in your own creative undertaking, wherever you are in your practice, and give yourself permission to play. Although it may seem cliché, I mean every single word…you will be forever changed and so incredibly grateful for this experience.